Full length human EB3 fused to a tag, purified from E. coli BL21 bacteria. Our Abpromise guarantee covers the use of ab53360 in the following tested applications. WB Use a concentration of 1 µg/ml. Detects a band of approximately 32 kDa (predicted molecular weight: 32 kDa). May be involved in microtubule polymerization, and spindle function by stabilizing microtubules and anchoring them at centrosomes. May play a role in cell migration. Predominantly expressed in brain and muscle. Belongs to the MAPRE family. Contains 1 EB1 C-terminal domain. Composed of two functionally independent domains. The N-terminal domain forms an hydrophobic cleft involved in microtubule binding and the C-terminal is involved in the formation of mutually exclusive complexes with APC and DCTN1. Cytoplasm > cytoskeleton. 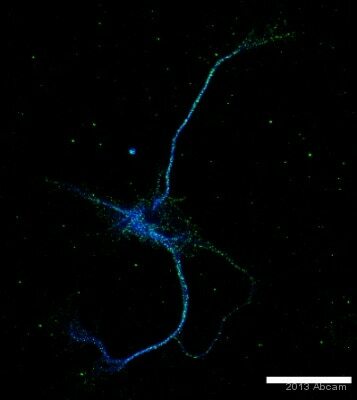 Associated with the microtubule network. 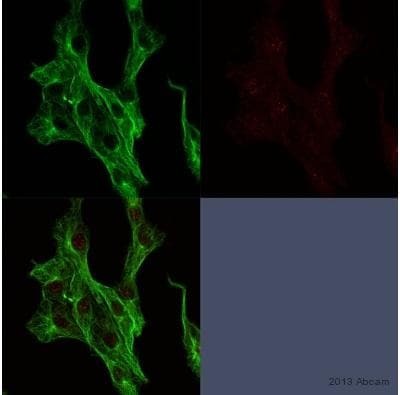 Immunofluorescent staining for COS7 cells overexpressing EB3, using ab53360 at 1/100. Immunofluorescent staining of cell mitosis using ab53360 crude culture supernatant diluted 1:10 (Please note that there was about 50-100 ug/ml antibody in the supernatants) COS7 Transformed African Green Monkey Kidney Fibroblast Cells. Overlay histogram showing SH-SY5Y cells stained with ab53360 (red line). The cells were fixed with 4% paraformaldehyde (10 min) and then permeabilized with 0.1% PBS-Tween for 20 min. The cells were then incubated in 1x PBS / 10% normal goat serum / 0.3M glycine to block non-specific protein-protein interactions followed by the antibody (ab53360, 2µg/1x106 cells) for 30 min at 22ºC. The secondary antibody used was DyLight® 488 goat anti-rat IgG (H+L) (ab98386) at 1/500 dilution for 30 min at 22ºC. Isotype control antibody (black line) was rat IgG2a [aRTK2758] (2µg/1x106 cells) used under the same conditions. Acquisition of >5,000 events was performed. Publishing research using ab53360? Please let us know so that we can cite the reference in this datasheet. I would like to confirm you that ab53360 has not been tested for use in mouse samples and therefore is not covered by our 6 month guarantee. Reviewing this case, I would like to offer some suggestions to help optimise the results from ab53360. 1.) Some epitopes are very sensitive to methanol as it can disrupt epitope structure. Can try acetone instead for permeabilization if required or use 4% PFA and a permeabilisation agent. 2.) I suggest to use 1%BSA / 10% normal goat serum / 0.3M glycine in 0.1% PBS-Tween for 1h to permeabilise the cells and block non-specific protein-protein interactions. 3.) I Since the secondary antibody alone give high background, I strongly recommend to use a duifferent antibody. Since mouse and rat are very closely related, I suggest to use a secondary antibody that is pre-absorped against cross-reactivity to rat. Please send an image of your results, this will help us to provide suitable tips. I hope this information is helpful, thank you for your cooperation. Thank you for your replay. The ab13859 was tested for WB - I wished to see the protein by IF. Prior getting your e-mail we have already purchased the AB (Abcam order (ref:ORDER #xxxxx) despatch confirmation xxxxxx- if it still would be possible to apply a discount code I would be very grateful. This code will give you: 1 freeprimary antibody or the value of ab53360off any product in our catalogue before the expiration date above. To redeem this offer, please submit an Abreview formouse and/or ratand include this code in the “Additional Comments” section so we know the Abreview is for this promotion. 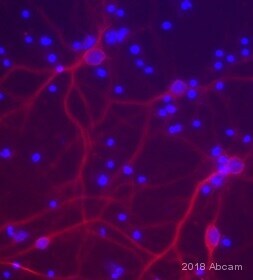 I wished to use the antibody against murine and/or rat native EB3 in cultured hippocampal neurons - do you think the antibody would be suitable? The immunogen used to raise the anti-EB3 antibody [KT36] (ab53360) was of the recombinantly expressed full length human EB3 protein. This shares 99% homology with the rat and mouse protein. We would therefore predict that the antibody would cross react. However, as wehave not tested this ourselves as yet we would not be able to guarantee this. If you would be interested in participating in this scheme please do let me know as a discount code needs to be issued prior to the purchase of ab53360. Alternatively, you may want to have a look at the rabbit polyclonal ab13859 which we have shown is able to detect the human, rat and mouse protein. As yet, we have not tested the Anti-EB3 antibody [KT36] (ab53360) in any rodent species. However, this does not mean that the antibody would not work. As the immunogen used to raise the antibody, full length human EB3 fused to a tag, shares 99% homology with the mouse and rat protein, we would expect the antibody to be able to detect these proteins. As we have not tested it we would not be able to guarantee it. If you can describe the experiment you are hoping to perform (which type of samples and application)I can see if I would recommend trying this antibody or if we have any other antibodies against this target which may be more suitable.